What’s That Car Tony Stark Drives in IRON MAN 3? Tony Stark, a.k.a. Iron Man, is seen driving a stunning new sports car in “Iron Man 3“. The answer, for the most part, is an Audi R8 e-tron. But there’s more to it than that. I actually had a chance to drive the R8 e-tron prototype a while back – up and down the Pacific Coast Highway in California where Mr. Stark’s mansion is (or was) (sort of*). The R8 e-tron, in a word, rocks. The real R8 e-tron is powered only by electric motors. They produce 326 horsepower and 604 foot-pounds of torque. It has no gasoline engine. Step on the gas and be prepared to be slammed back in the driver’s seat. It will rocket from a standstill to 60 m.p.h. in just 4.2 seconds! Nobody knows exactly what its top speed is (this is true). Theoretically, it could just keep going and going, until the Energizer Bunny stops beating his drum. How far that is, varies wildly, depending on how hard the car is driven. It’s calculated range is 154 miles, based on the European Union’s combined driving cycle test. Mr. Stark’s movie ride, of course, is a slightly tricked-up version of the actual car. For one, the actual car doesn’t fly – or at least it doesn’t get airborne. The actual R8 e-tron also does not make any vroom-vroom noises like Mr. Stark’s – those noises had to be dubbed in, because as an electric vehicle, the e-tron is utterly silent. It doesn’t even have exhaust pipes. The actual car may go on sale in limited numbers to the general public (or at least the 1%) next year. No word yet on how much it might cost. But figure on something in six figures. Well into six figures. The gas-powered R8, with all the whistles and bells, costs almost as much as a Lamborghini – which is the R8’s corporate cousin. Audi’s R8 e-tron commercial featuring Tony Stark at work. 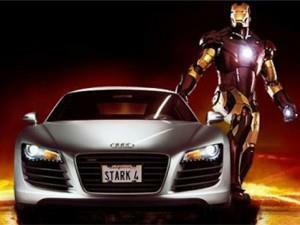 Iron Man 3 marks a “return to the fold” with Audi for Tony Stark, in the ultra competitive world of automotive marketing. In the last Avengers movie, Stark was seen driving – gasp! – an Acura NSX prototype. In the first and second installments of the Iron Man trilogy, the Audi R8, R8 Spyder, A8, S5, and Q7 were all featured. * Tony Stark’s mansion was computer generated, but filmmakers used a real site at Point Dume in Malibu, California to position it. « Miami To Barcelona on Norwegian Epic: Worth It?